Since there won't be an Armchair Book Expo this year to coincide with the Book Expo of America, I'm organizing a smaller scale event for bloggers to get together to discuss various topics and to network with other bloggers and publishing industry people. You can do as little or as much as you want. The point is to have FUN! There will be a link up each day for that day's topic (it will be live shortly after midnight EDT each day). Be sure to link up your daily post (if you do one) so we can all visit your blog. I encourage everyone to leave comments. If you have questions, please leave a comment below as others may have the same question and it will help me by not having to answer the same question over and over. 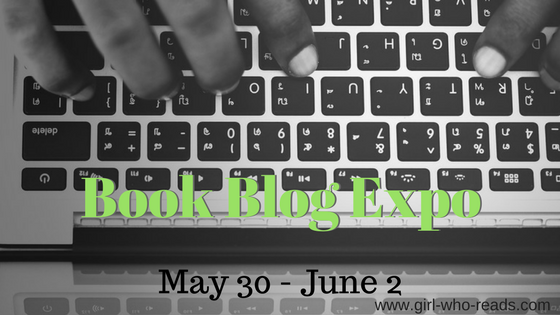 Remember to include the hashtag #bookblogexpo on all your posts (Twitter, Facebook, Instagram, etc.) so we can find them. Day 1 - May 30 - Introductions & How to Network. Since networking starts with an introduction, we will roll these topics into 1 post. Gives us the 411 on you - who, what, where, when, why and how. Who are you, What do you blog, Where do you blog (also share where to find you on social media), When did you start blogging, Why do you blog, How do you go about your blogging and being involved in the book community (how do you network). Day 2 - May 31 - Favorite Section in the Bookstore. Do you head straight to the new releases or bargain rack? Do you spend hours perusing the mysteries or perhaps you can't drag yourself out of the young adult section? Or is there something unique about your local indie bookshop that makes it a must stop every time you pass it? Whether you shop in a brick and mortar or an online bookstore, what is your favorite section? Consider discussing the genre itself or providing a list of favorite (or recent) finds. Day 3 - June 1 - Most Anticipated Books & Giveaway Day. Tells us all about the books you are most looking forward to this year (share even if your most anticipated book of the year has already come out). And since we are talking about anticipated books, what more anticipated than winning a great prize? If you are doing a giveaway, please include it in this day's post. Day 4 - June 2 - Blogging Advice. Do you have tips to share or need help with some aspect of your blogging? Today is the day to give and ask! This is a time for the blogging community to shine by helping one another out. Day 5 - June 3 - Catch up & Wrap up (optional). You can use this day to catch up on blogs you may have missed, announce your giveaway winners, or share any final thoughts. Or just catch your breath before going back to your regular blogging program. Be creative with these challenges. I'm not going to give much direction here as to what to picture for each challenge. Day 1 - May 30 - Books + other interest(s). Help us get to know you. Day 2 - May 31 - Where are your books? Are they on a shelf, next to the bed, holding up one end of the coffee table? Day 3 - June 1 - To Be Read. Is your pile towering? Which ones are you anxious to get to? Are there books you've forgotten you had? Day 4 - June 2 - Beautiful Covers. I know we aren't supposed to judge a book by its cover, but some covers are works of art. Have you bought a book just because you loved its cover? Day 5 - June 3 - Show off. Are you good at spine poetry or at taking an exceptional bookish photo? Show off your most coveted book or your awesome book organization. Toot your own horn! Wednesday, May 30 at 8:00 - 9:00 pm EDT. Saturday, June 2 at 10:00 - 11:00 am EDT. Please use the hashtag #BookBlogExpo. Feel free to chat with one another on Twitter throughout the event, use the hashtag so anyone else available can chat too. This event is very much about networking and connecting with others in the community. Blogging can be a lonely interest, but it doesn't have to be. I encourage to follow each other on social media, comment on posts, interact on social media this week and beyond. Plan your posts in advance. If you can schedule your posts in early then you can just focus on visiting the other blogs. Also, don't get overwhelmed with the topics. A short post is fine. A list type post can keep me from rambling and are also easy for the reader to follow. If you are doing a giveaway, I recommend keeping entries simple (no one really wants to do 10 different entries on 10 different blogs). You can use Rafflecopter or if you just want to draw a number, then I recommend Random.org (it will randomly generate the number). I also recommend keeping your giveaway open through Saturday at least to give more people time to get by your blog. 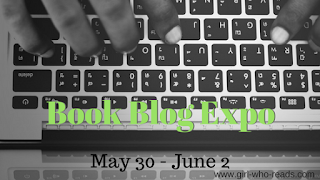 Remember to use the hashtag #BookBlogExpo! If you are planning to participate, link up below so we can start following one another. A daily linkup will be provided for the daily topics. I'm so sad I'll be missing the Saturday Twitter chat! :( Have fun everyone! Aw. You will be missed. I didn't know about this until i saw Erica Robyn Reads post. I'll definitely have to keep a lookout. I'm glad you found us. You can jump in any time. So sad that I did not know about this :( I loved and helped with Armchair and would have loved to play too! I'm sorry you missed it. I couldn't figure out the best way to get the word out to all the former Armchair BEA peeps. We'll do it again next year (unless Armchair BEA comes back). Sign up for my newsletter as I will send out a note about it early next year.